Jack Welch, who is followed by more than 1.4 million people on Twitter, has been under fire for weighing in on controversial situations before. 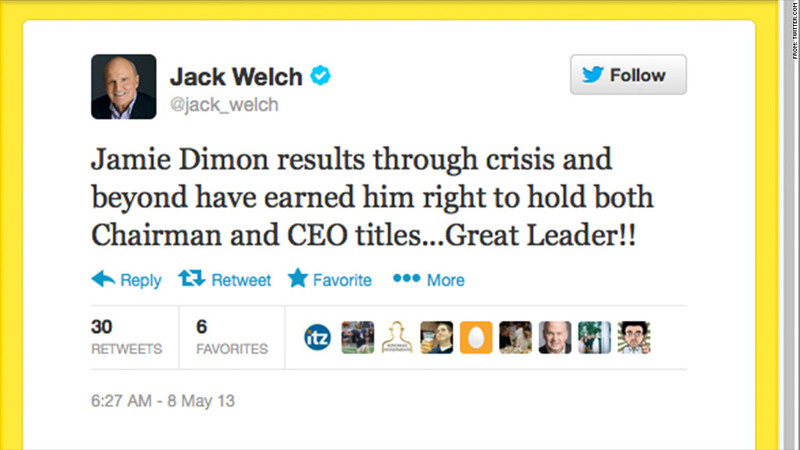 Jack Welch is making waves on Twitter again. The former CEO of General Electric (GE)weighed in on the brewing controversy over JP Morgan Chase (JPM) CEO Jamie Dimon's role at the company. "Jamie Dimon results through crisis and beyond have earned him right to hold both Chairman and CEO titles...Great Leader! !," he tweeted on Wednesday morning. The tweet comes as a swell of shareholders are pushing for the board to strip Dimon of his role as chairman. Two major shareholder advisory firms are advising clients to vote for an independent chairman at J.P. Morgan, after the bank's big bet on derivatives last year resulted in nearly $6 billion in losses. Last year, 40% of the company's shareholders voted for an independent chairman. Welch, who is followed by more than 1.4 million people on the social network, is no stranger to making contentious comments on Twitter. In October, he was pummeled for claiming the government fixed the unemployment rate to help President Obama's chances at re-election.